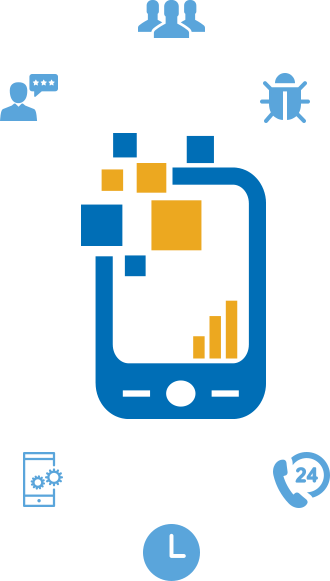 IT Chimes is a leading Windows Mobile Application Development Company offering dynamic solutions for a wide range of portables and mobile devices. The World is Going Mobile, Why Aren’t You? With the ever increasing number of mobile users around the globe, IT Chimes Mobile Application Development team has kept pace with the latest technological trends in mobility solutions to keep our clients happy. We will give you access to an audience of millions of mobile users from diverse backgrounds ready to be captured through a tiny yet powerful mobile application that delivers your services to them on the go. Whether you own a restaurant, legal service, gift shop, health organization or an eCommerce business, a mobile app can drive your business to new heights. 200+ iOS, Android and Windows apps delivered for clients in ecommerce, telecom, logistics, healthcare, FMCG and other industries. The iOS mobile platform, that powers iPhones and iPads, opens up innumerable options for mobile app developers. Our team at IT Chimes knows and understands how to tap the full potential of the iOS to deliver mobile apps that encompass cutting edge technology and innovative designs. Android is perhaps the most popular and widely used mobile platform in the world, and hence the most obvious choice for mobile development. Businesses that aim to capture wide audiences can now achieve their targets through our smart apps that are both engaging and feature rich. IT Chimes is a leading Windows Mobile Application Development Company offering dynamic solutions for a wide range of portables and mobile devices. The popular Windows based applications is built with help of Microsoft Foundation Classes (MFC) and is based on the concept of Object Oriented Programming (OOPs). At IT Chimes, one of the largest mobile application development company in India, our team of J2ME developers possess strong ability in this domain and can assist you with a wide range of business solutions for your mobile handsets. No matter what may be your requirement, our experts are sure to find a solution that can enhance the overall capability of any mobile device. Our talented team of developers can create cross-platform mobile applications that can run seamlessly on multiple mobile platforms enabling clients to target a variety of audience through a single app. You need the services of an IT company that has years of experience in building quality apps. Our mobile application development is responsible for creating over 200 highly innovative and successful mobile apps for a multitude of satisfied clients. You need a company which uses the latest technology for app development. The mobile app development team at IT Chimes consists of exceptional designers and programmers who are equipped with the latest tools of mobile technology. This enables them to develop stunning apps that are powerful enough to accomplish large data and processes. You need a company that works and delivers in the specified time frame.Our mobile application development team works in a time bound schedule to remain constant on our promise of timely delivery. You need a company which focuses on research and is able to create an app that is unique and best in the market. Here at IT Chimes we put in hours of research and market study to understand your business and create an app for you that is better than its peers and likable by the customers. You need a company that ensures the highest quality of their products. At IT Chimes we have put in place a stringent and ‘no compromise’ mechanism to check the quality of the apps that we develop to ensure that they are free of bugs and can perform exceedingly well in all circumstances. You need a company that is always ready to help you no matter what. Our clients at IT Chimes enjoy the privilege of having a dedicated customer support staff which is available 24×7 to answer all their queries and guide them whenever needed.